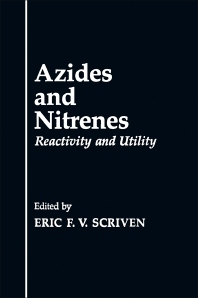 Azides and Nitrenes: Reactivity and Utility provides information pertinent to the fundamentals aspects of the chemistry of azides and nitrenes. This book discusses the mechanism and synthetic applications of alkyl azides. Organized into 10 chapters, this book begins with an overview of the properties and chemistry of alkyl azides and alkylnitrenes. This text then examines the various pathways to the preparation of vinyl azides. Other chapters consider the magnetic resonance spectrum of phenyl azide, which may be taken as a representative to which more complex examples can be related. This book discusses as well the acyl azides and acylnitrenes that have their nitrogen function attached to electron-withdrawing groups not possessing a heteroatom bearing an unshared electron pair next to the nitrogen function. The final chapter deals with the main uses for organic azides involved in photochemical cross-linking of polymeric systems. This book is a valuable resource for chemists, spectroscopists, and theoreticians.